Two types of wolves live in Manitoba -- the red wolf and the gray wolf. The red wolf is of the same genetic pool as red wolves living in the United States and Mexico. Some researchers believe the gray wolf in Manitoba to be its own subspecies, dubbing it the Manitoba wolf. Gray wolves, which are scientifically known as Canis lupis, have varying coloration in shades of gray to black. Some sport a little white and others are predominantly white -- hence the common name gray-white wolf often used in non-scientific circles. Gray wolves range in height from 26 to 32 inches at the shoulder and weigh anywhere from 55 to 130 pounds, males outweighing females. They feed on larger hoofed animals such as moose, elk and, if given the opportunity, domestic bovines. Gray wolves prefer forest lands. A large portion of Manitoba's gray wolf population centers in the Riding Mountain National Park, where they are protected from hunting. 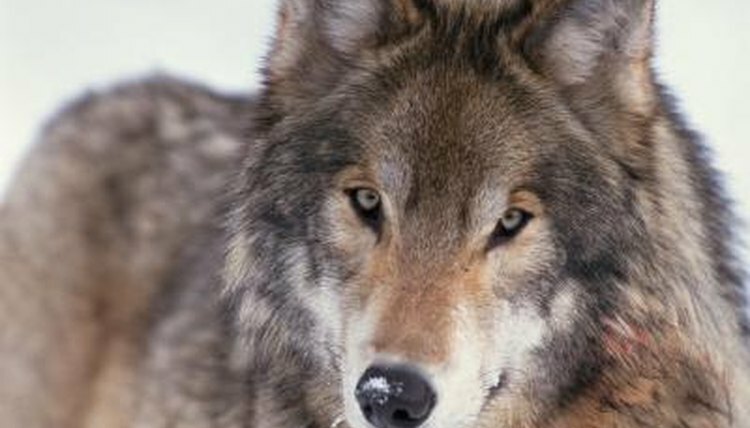 This population of wolves declined significantly between 1992 and 1997, when the number of individual wolves dropped below 40, according to Parks Canada. As of 2012, park officials have counted 113 individual wolves living in packs ranging in size from six to 10 members. Red wolves are scientifically known as Canis rufus and more closely related to coyotes than to other wolves. They are much smaller than gray wolves. They are approximately 15 to 16 inches tall at the shoulder and weigh 40 to 90 pounds, males outweighing females. They have brown coloring with streaks of cinnamon red and black. They prey on smaller games such as grouse, raccoons, rabbits, hares, rodents, carrion and domestic livestock. Red wolves do not necessarily prefer forested areas, but they do tend to live in areas with heavy vegetation where their prey also live. A thriving population of more than 100 individual red wolves centers around Duck Mountain, which is a Manitoba provincial park. The terrain of Duck Mountain does include some forestland, but it also features the dense shrub-type vegetation and marsh lands red wolves prefer. Northern Prairie Wildlife Research Center: Return of the Wolf?